JEFFERSON CITY, Mo. - Rudolf Diesel couldn’t have imagined how far his vision would have come by 2017. In the U.S., nearly 3 billion gallons of clean, renewable fuel replacing its petroleum counterpart. A thriving and growing diesel vehicle market. And 64,000 jobs supported by biodiesel, many the highest paying jobs in the area. Diesel, who invented the engine that bears his name, ran early models on peanut oil, and was an ardent believer in vegetable oil-based fuel. That’s why the biodiesel industry honors Diesel by making his birthday, March 18, National Biodiesel Day. Owner, Emergent Green Energy. Matthew Jaeger grew up on a Kansas farm, and his brother Luke’s vision of producing fuel for their equipment spurred the beginning of EGE Biodiesel. Based in Minneola, Kan., EGE is a family agricultural-based business specializing in the delivery of American biodiesel to local and regional customers. With multi-feedstock capabilities, the company partners with local farmers, and with restaurants to recycle cooking oil and grease for use in the production of biodiesel. 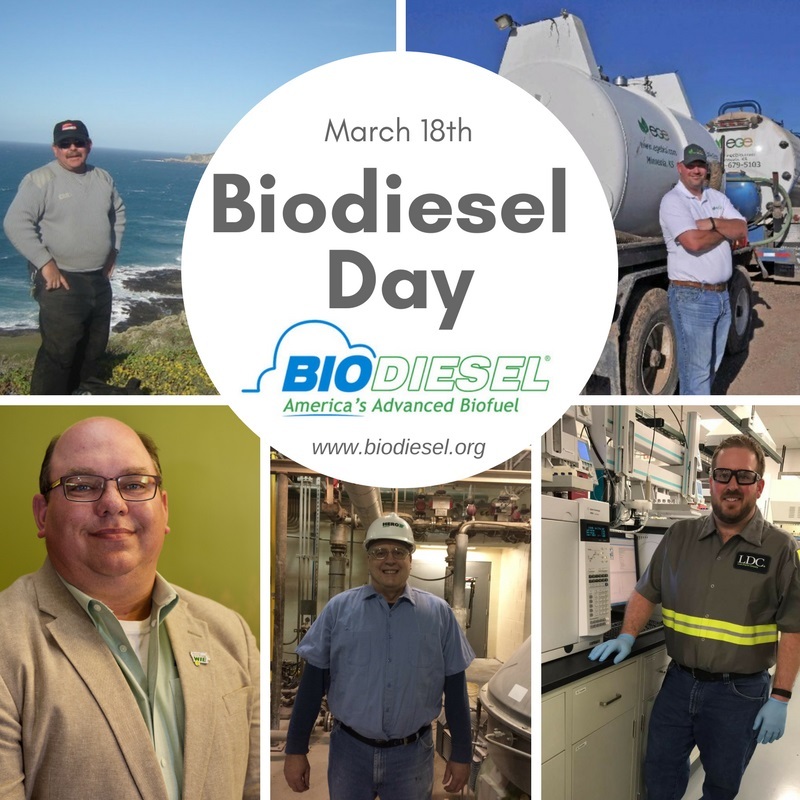 “Our success in producing biodiesel has led us in other directions of business, all connected back to the goal of helping farmers and adding value to what they do for other customers,” said Matthew Jaeger. Plant Chemist, Louis Dreyfus Company. Mike Morgan heads special projects, testing method development and validation in the laboratory for the largest fully integrated soybean processing and biodiesel plant in the U.S. Located in Claypool, Ind., the annual capacity for biodiesel production is 110 MGPY. Morgan first became passionate about biodiesel while in college at Utah State University, serving as a co-chair of NBB’s Next Generation Scientists for Biodiesel program. He also used biodiesel he made at USU to set record speeds on the Bonneville Salt Flats. Quality Consultant. Kent Bullard has served as an auditor for BQ-9000, the biodiesel industry’s voluntary quality assurance program, since 2004. With a master’s degree in quality assurance, he has audited 38 producers, marketers and labs. Auditors like Bullard have helped the program become a success; certified producers now account for more than 90 percent of the U.S. biodiesel volume. As a user himself, Bullard is also considered a biodiesel pioneer. While serving as fleet manager at Channel Islands National Park off the coast of Los Angeles, he led one of the first biodiesel programs at a national park, from 2000 until he retired in 2012.